It provides typical dystocia cases, including normal delivery, cord around neck delivery, breech delivery, pre-eclampsia, caesarean, omphaloproptosis, premature delivery, potential antepartum and postpartum hemorrhage, etc., guiding obstetrics staff to identify different stages of labor, abnormal process of clinical diagnosis through partogram and give proper treatment; it is available to give treatment via clinical fetal monitoring to diagnose fetal distress in time; training for neonatal nursing and first-aid. Drug identification system, vital signs of puerpera will change in according to different medication. Delivery: it supports the demonstration of labor mechanism of occiput left anterior position, along with automatic uterine contraction, including engagement, descending, flexion, internal rotation, extension, reset, external rotation, fetal shoulder and fetal disengagement. Delivery speed could be adjusted. Fetal head descends when contraction is happening, and it retract slightly during the interval. 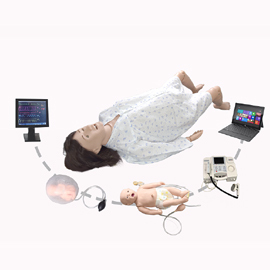 It could simulate common delivery methods, including normal delivery, breech delivery, placenta praevia, omphaloproptosis, fetal extractor assisted delivery, external version, simulated cesarean, shoulder dystocia, etc. Uterine contraction and fetal heart rate: uterine contraction and intermission could be adjusted through self-arrangement, uterine contraction intensity changes on the basis of labor stages; fetal heart rate curve could be set up in accordingly. Postpartum uterine massage; episiotomy and suture; suture and nursing of median incision, left lateral incision, right lateral incision; simulated practice of various clinical nursing operation of gravida; catheterization, venous transfusion, blood collection, blood pressure measurement, etc.